With winter slowly ending, Barry Justus knew that he had no time to spare in converting this homeowner's dream of a personal five-star resort into a multi-watershape, party-ready reality. This included the hidden slide and the vanishing television -- all on a rigid deadline. For most residents of southeastern Canada, the winter of 2013/2014 was memorable for off-the-hook low temperatures, plenty of snow and lots of discomfort. For me and my crew, however, what we’ll recall most is how hard we worked right through the teeth of the inclement weather to make a huge project deliverable by its May 2014 deadline. As was reported in the first article of this two-part series (“Against the Clock,” July 13, 2016 – click here), we walked onto a blank-slate, dirt-covered estate property in May 2013 with marching orders to turn it into the homeowner’s personal five-star resort in time for a long-weekend party he’d planned for May 2014. If we’d had nothing else to do, that might’ve been easy. But Poolscape, our Toronto-based design/build watershaping firm, has a thick project log and, for the first couple months, we mostly spent our time refining the design and gradually getting our ducks in a row during the summer for what we knew would be a big push once we gained access to the property. As reported in the first article, we gained that site access in September 2013 and began by building the big bunker that would underpin the watershapes atop it and provide mechanical support for everything we’d be installing on the surface, including two pools, a spa and several waterfeatures. Once the forms and steel were ready, we started pouring all of the structural concrete and managed to finish before winter arrived. We then covered our work area with a huge shelter and settled in for a long winter of feverish “indoor” watershaping. A proper tour of the property starts out front, where we set up a waterfeature that is independent of the pools and other watershapes. It sits atop its own small bunker, which houses the variable-frequency-drive pumps that power ten foam jets illuminated by 30 LED lights. As you pass through the house and emerge onto the deep patio, you’ll see a pair of raised, perimeter-overflow pools, each equipped with five foam jets. Set up as bookends, they both flow via copper spillways into small mid-level basins and then down another level, again via copper spillways, to reach the main deck level from which the swimming pool rises. All of the water for these features flows into one of the big surge tanks in the bunker below for filtering and treatment. As you pass down the stairway between the twin waterfeatures, you see to the left a raised, perimeter-overflow spa, completely finished in glass tile and granite. As was mentioned previously, the spa has its own surge tank in which the water is continuously heated. If the mood strikes the homeowner, he and the family can step into the fully heated tub within just a few minutes of deciding on a relaxing hot-water experience. Straight ahead is the main, upper pool. It has 1,200 square feet of surface area bordered by 196 linear feet of perimeter-overflow edge and, like the spa, is finished in glass tile and granite. Designed for relaxation, this pool has multiple step levels for easy access and plenty of seating. To one side there’s a shallow area that includes a sunken, hidden television that rises from a vault positioned just above water level. The area around the upper pool is well appointed with its almost-formal lounging and dining areas as well as plenty of casual seating near (and within) the water. 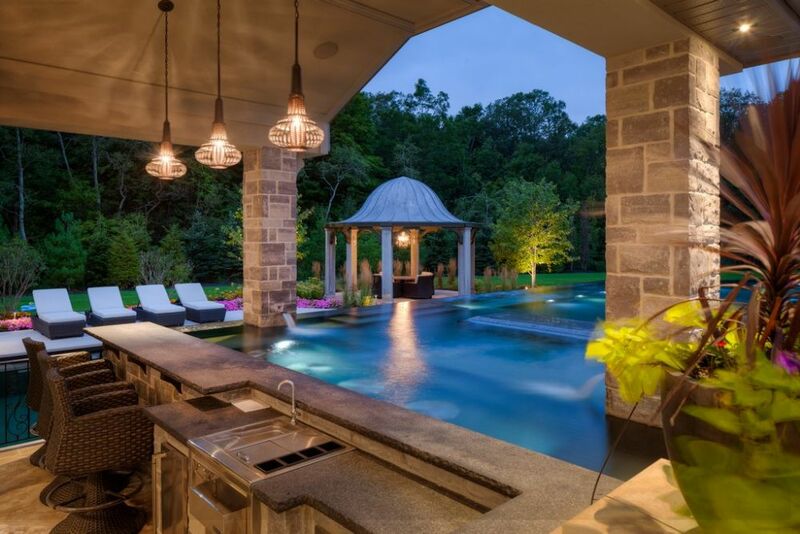 The gorgeous pool overflows around its entire perimeter, but the real scene-stealer is the two-screened television module that rises from a vault set within a shallow shelf – both sides within easy view of five or more seating areas. The main pool flows over its edges into the lower pool, a watershape that has 780 square feet of surface area and features a large, shallow lounging area as well as a 10-horsepower swim jet. This vessel drops to eight feet deep next to the cabana, which is where you’ll see the outlet for a 60-foot-long slide that is completely hidden from view – except for the big hole cut into the cabana’s wall. These two pools share a big surge tank in the bunker and have common filtration, heating and water-treatment systems. The decks and coping are made of Indiana limestone that covers an area of 6,000 square feet, all told. The outdoor space is also dotted with numerous fire features that help stretch the outdoor experience into cooler days and evenings. The landscaping was handled by another firm, Cedar Springs Landscape Group (Oakville, Ontario, Canada). They also installed the tennis court and its adjacent pavilion. The cabana plays an unusually important role in this project. It performs the usual functions, with a full bathroom and shower; it also offers some storage related to the full outdoor kitchen that sits just beyond its wall – and there’s a wood-burning fireplace and another big television as well. Where the upper pool is made for relaxation, the lower pool is designed for exercise and vigorous play, with a swim jet taking care of the former, while the latter is found in the form of a hidden, 60-foot-long waterslide that terminates just above the water level via a hole cut into the wall of the grand cabana. But the main purpose for this custom-designed, custom-built structure is the hiding of the big slide the client wanted as a fun-focused part of the project. The cabana may be more imposing than normal, but the fact that it completely contains a feature that would have completely disrupted the project’s clean, seamless visuals made it well worth the extra effort. The in-pool television is quite amazing. In getting things organized, I met with the audio crew early in the project to discuss conduit placement for speakers and their various other cabling needs. When I mentioned the client’s desire for multiple televisions, they mentioned one that operated on a lifting system that allowed the unit to be hidden from view when not in service. I suggested putting one of these elevating units within the pool – and we all took it from there. As far as we know, it’s the only one of its kind. And the coolest thing is that the paired screens can rotate to cover just about any viewing angle the homeowner desires. The pool is suspended over a large bunker, so setting things up to accommodate the television’s vault was no huge challenge – although paying strict attention to waterproofing and drainage while establishing safe electrical connections was imperative. The vault clears away any water that might get in while the system is up for watching. When it’s down, the cap sealing the vault is completely watertight. And given the hair’s-on-fire pace, an “effort” it definitely was, right along with the tasks related to completing the rest of the project’s components. We worked our tails off right up to the deadline and managed to finish only on the day before the big party, thereby dodging what would have been truly demoralizing penalties after so much stress and strain. As mentioned previously, it took a small, very well-trained army and unusually high and open levels of communication to make it all happen. True, the last month was utter chaos. But I have to say it was organized chaos, and we all lived to tell the tale!